Dr. Blanks is native to Lake Waccamaw, NC who earned her medical degree from East Carolina University. She completed her residency in Otolaryngology, Head & Neck Surgery and Facial Plastic Surgery at the University of North Carolina at Chapel Hill. Dr. Blanks joined Fayetteville Otolaryngology in January 2018. She maintains surgical privileges at Fayetteville Ambulatory Surgery Center, Cape Fear Valley Medical Center, and Highsmith-Rainey Hospital. Dr. Blanks also served as faculty in the Division of Otolaryngology at the University of Missouri and Mercy Springfield. 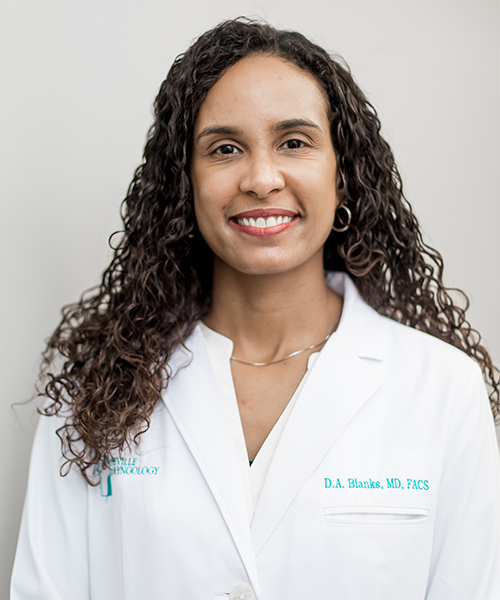 Dr. Blanks is a member of the American Academy of Otolaryngology (AAO) and American Academy of Facial Plastic and Reconstructive Surgery (AAFPRS). Blanks DA, Buss E, Grose JH, Fitzpatrick DC, Hall JW. Interaural time discrimination of envelopes carried on high-frequency tones: An acoustic hearing simulation of lateralization cues available to cochlear implant users. Ear and Hearing. 2008 Oct; 29(5) 674-83. Dr. Blanks has been extensively published and has presented her research at various locations including Vietnam, Suriname, Washington, D.C., Las Vegas, NV and Denver, CO. Dr. Blanks is a proud wife and mother of one daughter. In her free time, she enjoys running, swimming and spending time with her family. She is also very active in her Native American heritage and enjoys spending time at traditional powwows.